Congratulations to Taylor Guerrero for being recognized by district coaches. Taylor made 2nd team all-district. The Mountaineers finished their fine season with a loss to May in Bi-District 26-58 Tuesday night. The loss puts the Santa Anna boys team record at 16-9. We are very proud of our boys hard work and great effort for the entire year. This just adds to our district championship in Cross Country and our bi-district championship in football. Now let's finish the year out right with a great track and tennis season. Scoring: Jedidiah Herrod 7, Colton Enriquez 6, Jacob Herrod 4, Jacob Gibson 4, Lucas Diaz 2, Brandon Beal 2, Slater Isbell 1. The Santa Anna Cemetery Association is accepting bids for mowing of the Cemetery. The annual contract will begin April 1stand includes mowing and/or shredding as needed, blowing, weed eating and/or spraying. The Santa Anna boys basketball team beat Panther Creek Tuesday night 40-39 to advance in the playoffs. The Mountaineers will face the May tigers in Zephyr next Tuesday at 6pm for Bi-District. The win puts Santa Anna's record at 10-5 in district play and 16-8 overall. Scoring: Colton Enriquez 17, Jedidiah Herrod 11, Lucas Diaz 5, Jacob Herrod 3, Colby Nelson 2, Jacob Gibson 2. The Santa Anna Mountaineers won their fourth straight game Friday night against Panther Creek 48-40 to force a playin game Tuesday in Paint Rock at 6 pm vs Panther Creek. Scoring: Colton Enriquez 19, Jedidiah Herrod 12, Jacob Herrod 8, Colby Nelson 4, Brandon Beal 3, Slater Isbell 2. Record 9-5 in District, 15-8 overall. Ok, did the title get your attention? On Thursday Feb. 12, 2015, I met a very interesting young man, and by young man, I mean that he hasn’t reached 60. By the time he turns 60 he will have already reached home, and with all the interesting things he has incurred, he will have or should have written a book about his Journey. According to his blog “Cycling around God’s Creation” He flew from California in May 2014 to China. From the east coast of Asia across the Asian and European continent, He traveled on a 2nd hand bike. He told me that the front tire was still the tire that he started with. My name is Jeremiah Watt and the full time KEEPER of this blog, age 57 at the time of this writing. I am a saddle maker and silversmith when I am not pedaling my bike. Let me take a moment to introduce my son Pine, age 21, a 4th year student at San Jose State University here in California. This is not meant to be a true equatorial mileage ride, but rather a ride planned to keep us in a reasonably safe area of the hectic world we find ourselves living in, and still travel around the world. The route takes us north thru China, then into Mongolia mostly north by west to Russia. We will ride threw the barren rough Altai Krai region and on into the Ukraine. It is roughly planned that Pine will then pack his gear and fly from Kiev home so he can conclude his 4th year of study at San Jose State where he is a majoring in International Business. This post simply introduces the idea and plans that have been made so far. 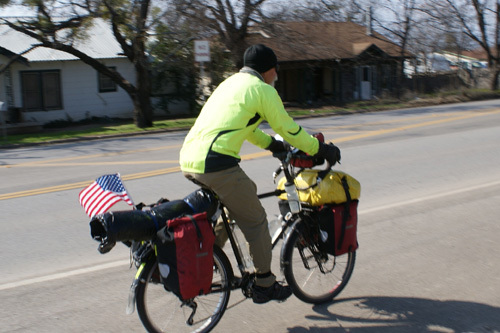 We are busy getting used to our bikes and all the gear such as panniers that attach to them. It’s all pretty new to us, we are both pretty fit…………..I think? Ready for this new adventure to start. I began over 2 years ago getting serious about lifting weights every day in prep for the amount of upper body mass that is lost on a extended tour such as this. I will be leaving with a little extra “CYCLING PUDGE” as a cushion to start, I currently tip the scale at 215 pounds. This is a copy of his first page. All spelling, words and thoughts are the property of the author. As I sat with MR. Watt, I say MR. because he is doing something about his dream, I learned a lot about country (Europe) that I had seen when I was young and energetic. Places that I had been that had changed to something I wouldn’t even recognize now. He talked about his adventures in places that I had never heard of. As I said at the start, a very interesting visit. He hopes to be in Sweetwater on Friday, if I didn’t hold him up too long. He told me that Sweetwater was within 6 miles of the midway point of his journey across the U.S.A. If I might suggest to get the most from his blog, start at the bottom (first) as the last post will be the most recent one. 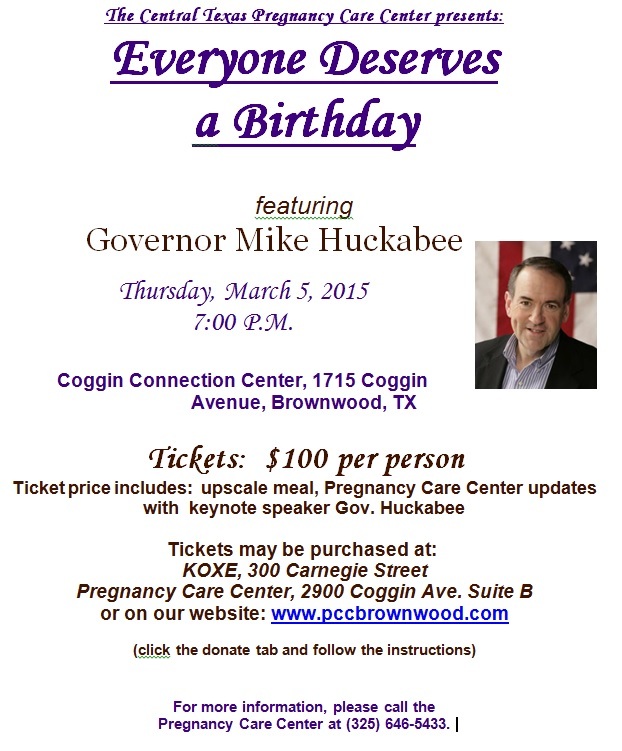 The Central Texas Pregnancy Care Centers 2015 Fundraising event EVERYONE DESERVES a BIRTHDAY featuring former Gov. Mike Huckabee. The Pregnancy Care Center is a non profit organization committed to help women with unplanned pregnancies make practical, LIFE choices for both the family and the unborn child. The Care Center is dedicated to educate families about parenting, health issues as well as encouraging men and women to become productive citizens. Please see our web site if you would like further information about the Pregnancy Care Center. The Lady Mountaineer varsity basketball team finished up the season last night with a loss to Rochelle 68-18. Leading scorer for the ladies was Jaylie Jones with 10pts. The ladies finished finished 4-20 overall and 3-11 in district. The future is bright, and we would like to thank you for all your support. Santa Anna boys held on last night for a 55-52 victory over the Rochelle Hornets. The win puts the Mountaineers in a must win position againts Panther Creek Friday night in Santa Anna. A win will force a playin game with Panther Creek next week for third place and will most likely play the May Tigers in the playoffs. District record 8-5, overall 14-8. Scoring; Colton Enriquez 25, Lucas Diaz 7, Jedidiah Herrod 6, Jacob Herrod 5, Jacob Gibson 5, Slater Isbell 5, Colby Nelson 2. The Lady Mountaineer varsity basketball team lost Friday night to Lohn 56-34. The ladies were lead in scoring by Shelbie Murray with 12pts., Jaylie Jones with 8pts., and Taylor Guerrero with 6pts. The ladies are 3-10 in district and will finish the season on Tuesday in Rochelle. Santa Anna boys basketball team beat Lohn Friday night 50-18. The win keeps the Mountaineers in the race for third with Panther Creek. District record 7-5 and 13-8 overall. Keeping their hopes alive, the Moutaineers beat Richland Spring in Richland Springs Tuesday night 47-19. The win moves the Moutaineers to 6-5 in district and 12-8 overall. Scoring: Colton Enriquez 14, Colby Nelson 11, Jacob Gibson 6, Jacob Herrod 5, Brandon Beal 4, Jedidiah Herrod 4, Lucas Diaz 3. The Lady Mountaineer basketball team traveled to Richland Springs last night and lost 79-24. The ladies were led in scoring by Taylor Guerrero with 5 pts., Jaylie Jones with 4pts., and Delaynee Absher and Laci Donham with 3 pts. The ladies are 4-17 overall and 3-9 in district. The ladies and gentlemen will play Lohn on Friday, here in Santa Anna, starting at 6:30. It will be senior night also. The first annual Hartman Holiday Huddle was held in Bangs, Texas on Saturday, January 31, 2015. The three oldest grandchildren of Edd and Ruby Hartman (Scott Walker, Mike Hartman, and Robin Bass) hosted the event. A delicious meal of brisket and sausage with all the trimmings was enjoyed by all. A pickup basketball game involving the younger family members (and a few older ones too) went on during the day. There was only one slight injury, and it was not one of the younger players. Everyone participated in a Chinese gift exchange. Gifts had to start with the letter “H”. It was amazing how many different items started with the letter “H”. There were very few duplicates. It was such a blessing to visit with everyone. We are all looking forward to next year.